GM’s August 2014 sales were technically down 1 percent compared to last August, but on a selling day adjusted basis, total sales were actually up 2 percent, led by an 18 percent increase in pickup sales over last year. In total, General Motors moved 272,423 vehicles last month. 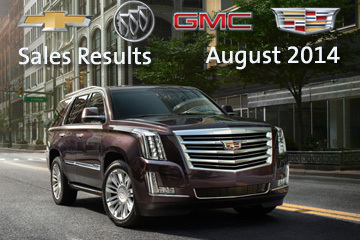 Highlights from August include a 38 percent increase in sales of Chevy and GMC large SUVs, Escalade deliveries up 64 percent, and Silverado and Sierra deliveries up 13 percent and 10 percent, respectively. In addition, the Chevy Express had its best August since back in 2008, and the Sonic saw its best August ever, with deliveries up 13 percent. Sales of the Buick Encore and Regal were up 13 percent and 29 percent, respectively, while Traverse deliveries shot up 11 percent and Acadia deliveries jumped up 5 percent.